I’m not a hoarder per se, all of my cats are currently accounted for and there were several things in the recycle and garbage bins this week. I am a saver (oh, not money – that goes to art supplies). I hate to throw things out that might be useful somehow. For the past several months the lids to the juice my kids enjoy have been calling my name so I finally sat down and upcycled one (okay, that word cracks me up, if you ever read Regretsy you’d know why). – Cut a 6-inch circle from piece of cotton fabric (or any lightweight fabric scrap). – Using a running stitch about 1/4 of an inch long, stitch around the circle. If you want to be fancy, turn the fabric under as you stitch, as shown in the picture, but you really don’t have to. – Pulling on both ends of the thread, tighten the stitching such that the fabric squeezes into a ball shape. 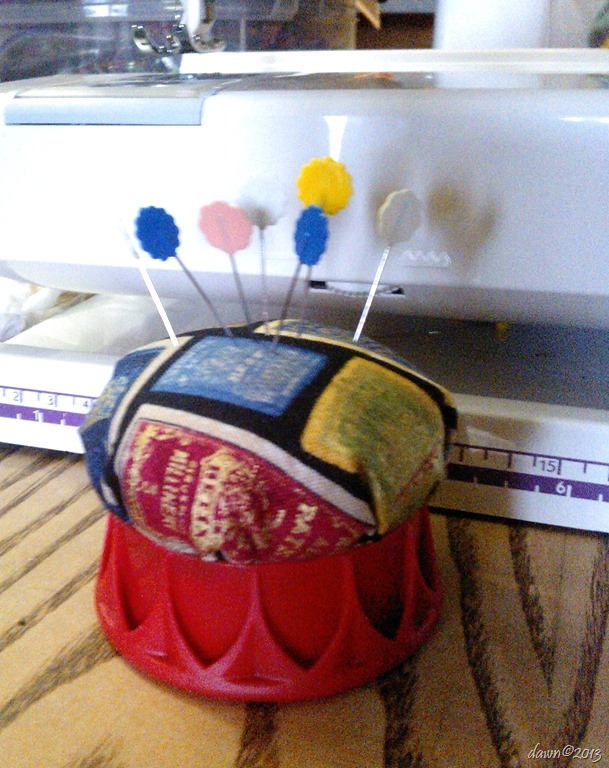 Using a handful of fiber fill, or scraps of fabric, fill the ball until it is full. Tie the ends of the threads, tightly closing the ball of fabric. – Glue a rock or other heavy object to the underside of the juice bottle lid. This gives the pincushion some weight. – Apply glue all along the inside top of the lid. 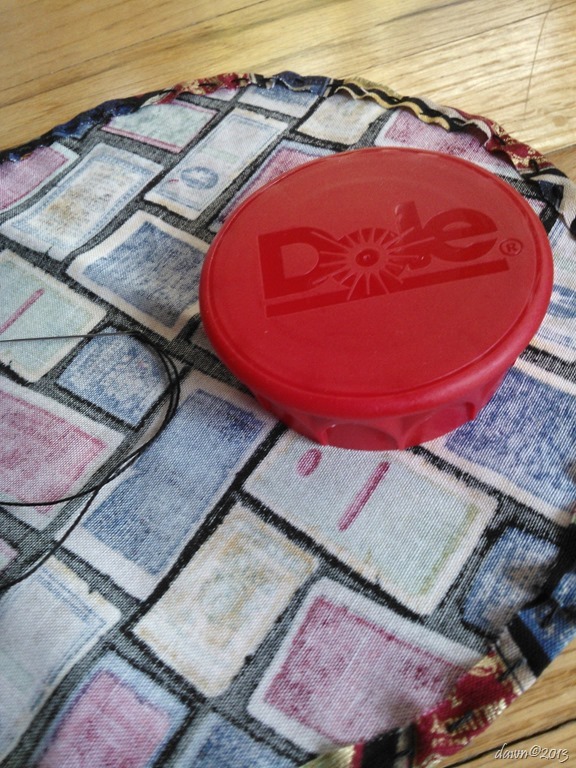 – Place the fabric ball on top of the lid and moving in a circle, tuck the ball down into the lid about 1/4-inch. – Turn the cushion upside down and weigh it down with a plate or other, not too heavy, object. Once the glue is dry, it is ready to use! Have fun. Let me know if you make one and how the instructions are.